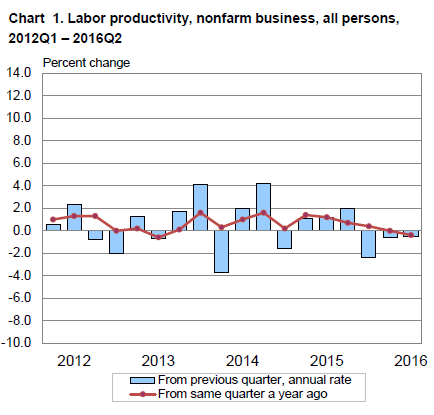 This cannot be good for jobs: In the second quarter, nonfarm business sector labor productivity – defined as output per hour worked – fell by an annual rate of 0.5% from the first quarter, the Bureau of Labor Statistics reported today. The third quarterly decline in a row. The last time it dropped for three quarters in a row was from Q3 1973 through Q3 1974 (5 quarters). Alas, in November 1973, the economy entered a recession. 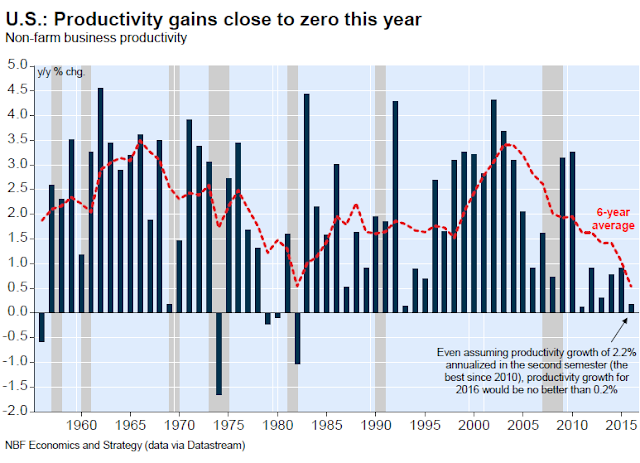 Several quarters in a row of declining productivity is not kind to the economy. The productivity decline in the second quarter this year was the result of output edging up at a seasonally adjusted annual rate of 1.2% while hours worked to obtain this output rose 1.8%. Year-over-year, productivity fell 0.4%. At the same time, unit labor cost rose 2.0% in the second quarter, the result of a 1.5% increase in hourly compensation and the 0.5% decline in productivity. Year-over-year, unit labor costs increased by 2.1%. Ideally, compensation rises to give workers more spending money, and productivity rises as much or more, so that workers and employers both come out ahead. But that’s not happening. Borrowing by corporations for the purposes of stock buybacks instead of investment in machinery and equipment does little to enhance an economy’s capacity for growth. We’re getting more evidence of that in the US where the average age of fixed assets is the highest in half a century and productivity growth is the weakest on records. Given the productivity declines in the first half of the year, and even assuming productivity grows in the second semester at the fastest pace in six years, productivity growth in 2016 is set to be close to zero. As today’s Hot Chart shows, that would mean a six-year average of roughly 0.5% for productivity growth, the lowest ever recorded. That cannot be bullish for the US labor market. It will eventually impact the labor market. Here’s why: despite the hiring that companies have been doing, sales – the ultimate measure of “output” – have been heading south since mid-2014. Total business sales, according to Census Bureau data, which include sales within the US by all companies, not just the largest in the S&P 500, peaked in July 2014 at $1.35 trillion. By May this year, the most recent data available, they’d dropped 4.4% to $1.29 trillion. Despite sales cascading lower for a year-and-a-half, nonfarm employment from June 2014 through July 2016 has risen by 5.6 million jobs! And that’s what the productivity decline is also showing: the additional labor hours have been accompanied by a decline in sales! Note that the Census Bureau once again adjusted its numbers for total business sales – downward as always. Since I’m a stickler for numbers, and for pointing out rose-tinted data-set bias, I have added the old numbers (brown line) to the revised numbers (red line). Some economists contend that the measurement of productivity itself is off because it just can’t be this bad! They contend that the government is doing a lousy job measuring productivity in the modern gig-and-social-media economy. That may be true. But the relationship between declining sales and rising employment points at a core problem: productivity is down – and is down sharply – or else, rising employment would lead to rising sales. Clearly, something is amiss. Sales and productivity cannot decline forever while companies continue to hire. Eventually companies are going to react in large numbers. They’re either going to perform miracles and get their sales to jump through hoops, or if that fails, they’re going to bring their workforce in line with their lower sales. 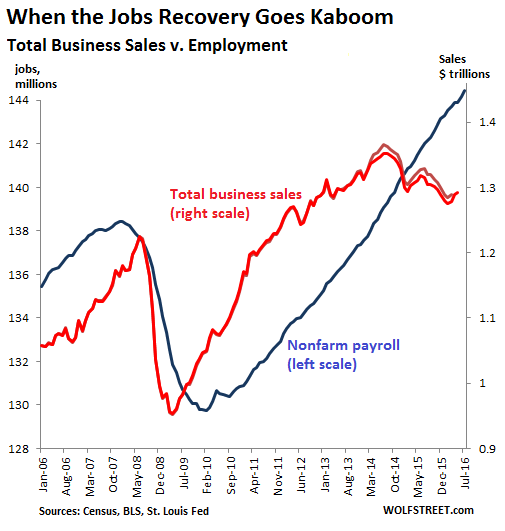 And that would be when the jobs recovery, as miserable as it has been, gets crushed.